What do you do after reading the ebooks in the SWA Ultimate ebook library? Lots! You can upgrade your skills and look into Blog Marketing. With your blog, you can create a place on the web where people will read, watch, and listen to what you have to say. You can talk about your business opportunity, compensation plan, products, and services. You will, in effect, DUPLICATE yourself, because people will be able to see or hear your explanation… even while you sleep. Soon, you’ll discover how you can maximize the things you’ve read and learned from SWA Ultimate! TrulyRichPinoy.com – Tara, mag stock market na tayo! Reserve your online store today! Answer of Manny M. Viloria﻿: “That’s the Get 4, Help 4, To Bring 4 system explained by Ronald Machete in YouTube. It is an MLM technique taught to him by Jeffrey Perez. The focus is on acquiring 4 Direct Referrals. 1. 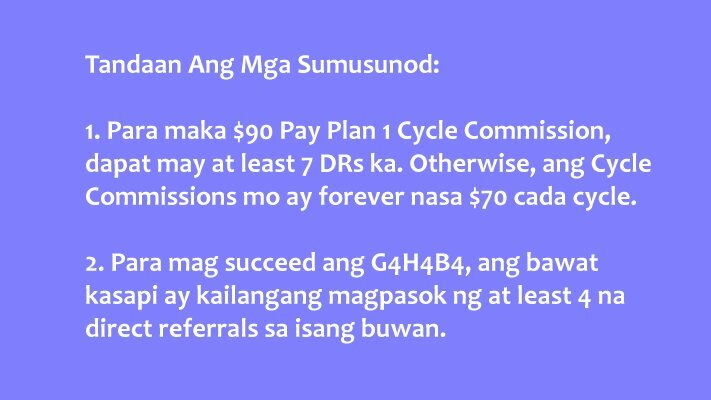 SWA Ultimate Pay Plan 1 Cycle Commissions will be pegged at $70/cycle if you have less than 7 Direct Referrals, which is going to be the case if you strictly follow the G4H4B4 system. 2. When you get 4 Direct Referrals, you will end up helping your 1st and 4th Direct Referral more, because (in terms of the $20 commissions), your 2nd and 3rd Direct Referrals get passed-up and you will not benefit from their direct referrals (as far as Pay Plan 2 is concerned). In other words, you will focus on 2 people (your 1st and 4th DR). 3. When your first 4 Direct Referrals each bring in their own 4 Direct Referrals, you will focus your help on their 2nd and 3rd Direct Referrals. In other words, you’re now going to focus on 4 people (the 2nd/3rd DR of your 1st DR, and the 2nd/3rd DR of your 4th DR). 4. In the next level, you will discover that you will benefit from 8 passed up $20 commissions. Therefore, you will now focus on those 8 people and help them acquire 4 Direct Referrals each. 5. You can see the pattern now. The number of people you will need to help and motivate will double each month. 6. You need a system that will easily and quickly train people on How To Attract 4 Direct Referrals In 30 Days. Otherwise, all your time will be spent helping and training more and more people. One of the things you will need to teach people is: How To Send Lots of Visitors To Any Website. In the July 28, 2014 official SWA Ultimate Newsletter, we first found out that Francis Hermes Sison Javier (aka Coach Kiko Javier) resigned from Supreme Wealth Alliance Corporation (SWAC) and Supreme Wealth Alliance Philippines Inc. (SWAPI) due to personal reasons and to pursue his t-shirt business. In the interest of disclosure and transparency, you should be aware that Coach Kiko was SWA Founding Member 001. This means that every SWA member was by default a downline of Coach Kiko Javier. Coach Kiko was also considered the right hand man of Francis Chaves. Kanang kamay ni FC si “Tatay” Kiko. Does this now mean that people whose direct SWA Upline used to be Coach Kiko now have Francis Chaves as their direct upline? 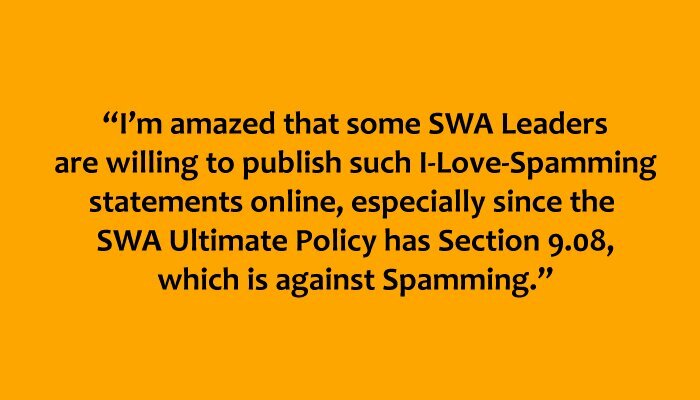 We’re still awaiting the response from the SWA Admins regarding that. Coach Kiko resigned effective July 2, 2014 and some people are wondering why anyone in the 001 position would resign. After all, even if he does not do anything, he will benefit from the marketing efforts of all his downlines. Each time someone cycles, that person will re-appear in a new slot in the SWA matrix. And eventually, Coach Kiko’s matrix will be filled with re-appearing SWA members which will help Coach Kiko earn cycle commissions from SWA. Why is Coach Kiko forfeiting this type of passive income? We don’t know. Perhaps he will say something about this in the future, but that’s just a guess. To Coach Kiko, thank you for inspiring us over the past 2 years. We wish you well in your future endeavors.